The British sculptor Gavin Turk is the subject of the second title in our New Art Up-Close series. 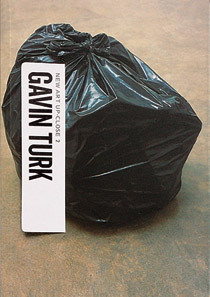 The book illustrates 25 carefully selected artworks spanning Turk's career, from his seminal blue-plaque work, 'Cave', through his many signature-based artworks, egg sculptures, and waxworks - including 'Pop', one of the truly iconic works of recent British art - to his more recent bronze casts of sleeping bags and bin bags. Also included are lesser-known works, some of which are reproduced for the first time, including documentation of performance and installation works. The interview with Turk focuses on the ideas behind his work: the nature of art itself, his use of popular celebrity and political imagery, and why it is that he makes art at all. The book also includes a short biography and further reading list, as well as notes explaining the contexts and layered art-historical references within each featured work. Gavin Turk rose to prominence in the early 1990s during the so-called 'young British artists' phenomenon: a wave of media interest provoked by an ambitious generation of artists with a flair for self-promotion. Turk's thoughtful, visually striking work gained him a reputation as an artist who questioned the nature and values of identity, pop culture, and art itself. While Turk was infamously refused his degree from the Royal College of Art, the work that cost him his qualification, 'Cave', has since gone on to become one of the most famous works in The Saatchi Gallery, where several of his other major works are also displayed. He lives and works in London, where he initiates artist-led public events, and continues to exhibit internationally. The Turk edition works particularly well, with some of his more esoteric works nailed down context-wise, allowing you to take a fresh look at his waxworks and performances.